We are your locally owned Mendota Heights dry cleaners conveniently located in Mendota Plaza off of Dodd Road, off of the intersection of Highway 110 and Highway 149. Award winning dry cleaning service conveniently located in the Mendota Plaza off of Highway 110 and Dodd Road near McDonalds and Walgreens. Find us towards the back of the building. The Mendota Plaza is an excellent one stop shop for all the items on your to-do list. We’re leading experts in eco-friendly dry cleaning. We bring you exceptional dry cleaning services without the harmful effects on the environment. We’ll take back any hangers you use and the plastic bags we use are bio-degradable. 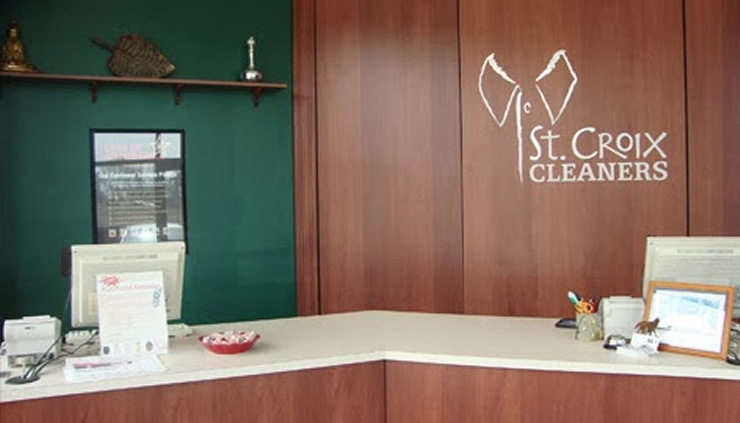 Using St Croix Cleaners for your garments is better for your clothes! Our dry cleaning solvents and soaps leave your clothes smelling fresh and clean. We spend a lot of money on our clothes and we want to make sure they last as long as possible. Opting into a green dry cleaner will prolong the life of your clothes. Our Mendota Heights store also provides expert care and high quality dry cleaning for your prom and formal dresses, blazers, suits and more. In addition to dry cleaning, we have a certified wedding gown specialist on-site. We are a member of the Wedding Gown Association and offer bridal gown alterations, pressing, wedding dress cleaning and preservation using museum quality methods. A team of expert seamstress’ and tailors are on staff at our Mendota Heights store to help you with all of your repair or alteration needs. When your clothes fit better, they’ll look and feel better. We want you to be sure your garments are in the safest hands for all your repair needs. I love the Emails with coupons on dry cleaning! Thank you!